Cut of out of work at 3 today and took my wife and daughter to pyramid for a an afternoon in the wind and let the noobie feel lake water for the first time. After tossin the kid around and setting up the shade I launched the toon boat and did a few passes on shot dog. No joy in the bay but managed to hook up and lose one when drifting the south side of the point. If I had to guess I'd say i was in about 20 to 30 feet of water and drifting right in the middle of the column. At the time I was throwing a white wind whistle (see our flys page if your not familiar with it) with a midnight bugger behind on the shooting head. The tube is a must right now. If you're familiar with shotdog point, the north side of it has some tufa rocks about 3 feet out from shore that stick out of the water by a couple of feet. Those rocks are about 2 to 3 feet under water right now. Casting past the shelf is tough and that water level is only going to up. River flows are at about 2500 at Reno right now with plenty of snow to keep feeding that til the end of the Pyramid season. 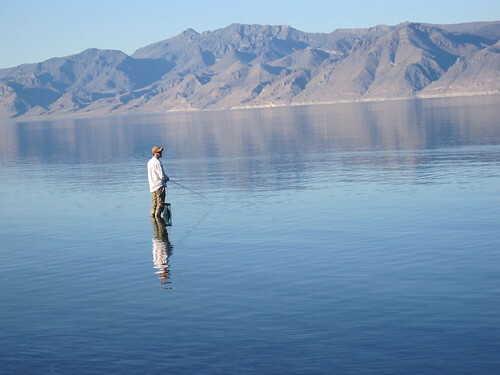 All reports are pointing to the standard Pyramid Lake strategy; hit the mornings, hit the evenings, streamers behind a shooting head and Nymphs under an indicator. Be advised, that water is still cold enough to make shorts and no waders a chilly idea, even on a pontoon. Took a quick trip out to Pyramid after work last night (June 7th). Got on my ladder around 6 and fished til about 7:30. Throwing olive / midnight cowboy buggers didn't produce anything on the shooting head and no luck soaking nymphs under an indicator. The water is way up and I did see fish in cruising the shallows along with some surface action but the bulk of it was a ways off shore. With the water being up as high as it is, casting from your ladder makes getting out past the shelf kind of tough. As the high pressure and nice temps set in the fish should get consistent but I recommend bringing the tube or pontoon boat out due to that previous mention of long casts to get beyond the shelf.